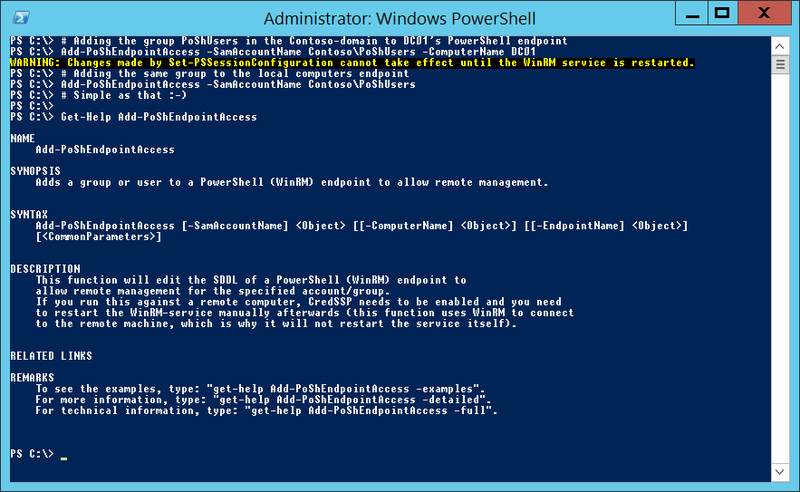 Only administrators can connect through PowerShell remoting (WinRM) with the default configuration, and if you are running a version older than Windows 8/Server 2012 you wont have the “Remote Management Users” local group to add non-admins to if you want to give them access to PowerShell remoting (WinRM). You can configure the access list of the endpoint(s) using “Set-PSSessionConfiguration -Name Microsoft.PowerShell -ShowSecurityDescriptorUI”, but it only runs locally and if you don’t want to build the SDDLs yourself the only alternative is to use the UI enabled by the switch in that example. The code for this function as been uploaded here. This entry was posted in PowerShell and tagged endpoint, Microsoft.PowerShell, PowerShell remoting, WinRM on 2015-05-25 by Anders.